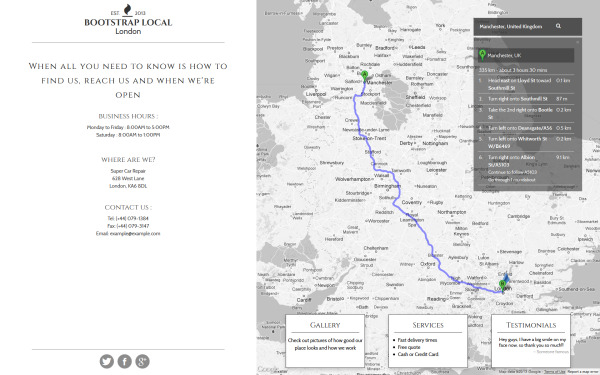 Bootstrap Local Business is simple one-page template for small businesses to show their most important features - where they are, their services, pricing etc. Are you someone that has a local business, but haven't set up a website yet or want to renovate your website? This theme keeps it simple but provides just what you need - how to find you, what you do, your prices and a gallery on a single page! Why use this theme? It's simple, clear and effective What most people want to know for brick and mortar businesses is where they're found and how to get to you. We have a big map for this and the user can simply enter his location and get driving/walking directions straight away. People also simply want to know how to contact you - the phone number/email address are right infront of their eyes. There are also links to social sites that you can take advantage of at the bottom of the page. The other thing is your pricing - The user can simply click on 'Services' to see what you provide and average/fixed costs. There's also room for othr pages such as Testimonials and a gallery if needed. Anyway, this is pretty much all that a user will want from you're website - all on one page! The site is also responsive - meaning people googleing your site on their mobiles won't have a problem getting your information. We've coded this in LESS so it's really easy to change the fonts and colour. We've even included 6 different colour schemes as examples for your barber, cafe, car repair company or any local business you may have.